Craving for some sweet treats? 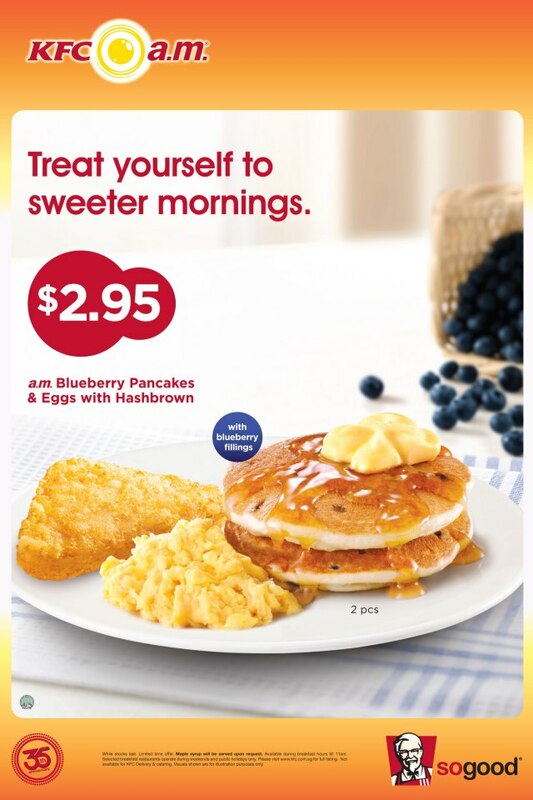 Satisfy your morning hunger pangs with KFC a.m.
Blueberry Pancakes & Eggs with Hashbrown for just $2.95! Valid till 2 Oct 2012 only, so hurry! While stocks last. Limited time offer. Maple syrup will be served upon request. Available during breakfast hours till 11am. Selected breakfast restaurants operate during weekends and public holidays only. Please visit the Locate Us page for full listing. Not available for KFC Delivery & Catering.